Option Backtester The Exact Trigger that Indicates Volatility in ASML Holding N.V. 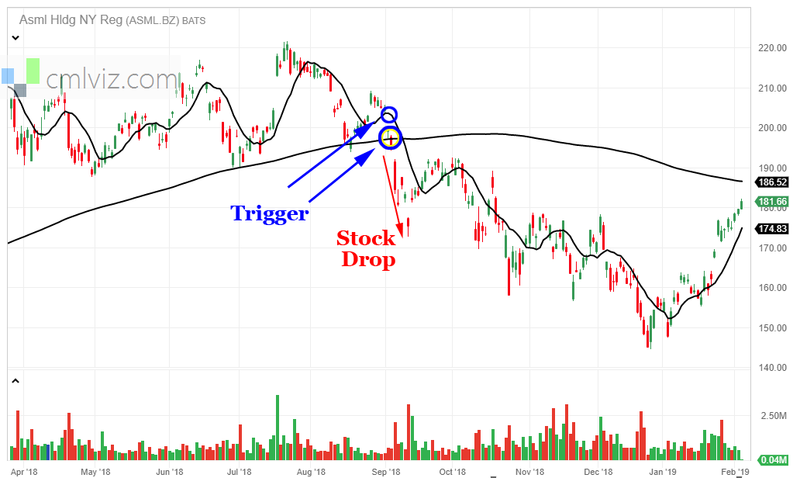 There is a trigger in ASML Holding N.V. (NASDAQ:ASML) that has preceded a large stock move and that move has created a powerful option trading opportunity in the past. It hasn't triggered yet, but the recent stock rise makes it closer. Use Trade Machine to set alerts for all the triggers you find -- let it do the work rather than you having to stare at the screen all day. Emails (or texts) when triggers fire -- Trade Machine watches the market for you. ASML is a chipmaker, and it has had its bull run and then a sputter, and then a recovery, like the other semi-conductor makers. The trigger we're after is the one that indicates when a period of volatility is about to start, so a non-directional option trade may be in play. The strategy won't work forever, but for now it is a volatility back-test that has not only returned 866.3%, but has also shown a win-rate of 72% while taking no stock direction risk. We have previously discussed this same trigger with Amazon (AMZN), Apple (AAPL), and PayPal (PYPL). A portfolio of the same strategy in several stocks isn't really diversified, it's just the same risk taken over and over again. These non-directional trades, together with bullish and bearish trades, create a portfolio of option trades. The Short-term Option Volatility Trade in ASML Holding N.V.
➡ The average percent return per trade was 35.28%. You can check to see the moment a stock dips below the 200-day MA for ASML on the Pivot Points tab on www.CMLviz.com. Back-testing More Time Periods in ASML Holding N.V.
ASML cracked that technical trigger on Sep 5th, and the next day the stock dropped $11, with the strangle gaining 85% in a single day. Here it is on the stock chart, where the sweeping black line is the 200 DMA and the volatile one is the 10 DMA.